Johann van Graan has made seven changes from the team that defeated the Ospreys last week for the trip to Parc y Scarlets tomorrow (kick-off 5pm). Centre Rory Scannell returns to the starting XV for his 100th Munster appearance and will become the youngest ever player to reach that landmark having turned 25 in December. It’s all change in the half-backs with Alby Mathewson and Bill Johnston coming into the side. The final addition to the backline sees Ronan O’Mahony named on the right wing. John Ryan returns from international duty to start at tighthead prop, Jean Kleyn has recovered from illness to start in the second row and Conor Oliver is named in the back row. Mike Haley starts at full-back with O’Mahony and Darren Sweetnam named on either flank. Scannell is partnered by Dan Goggin in the centres with Mathewson and Johnston at scrum-half and out-half respectively. Jeremy Loughman, Rhys Marshall and Ryan pack down in the front row with Jean Kleyn and captain Billy Holland in the engine room. Fineen Wycherley, Oliver and Arno Botha start in the back row. The province have won seven games in a row and lead Guinness PRO14 Conference A by a single point. Scarlets have lost just one PRO14 game at Parc y Scarlets since September 2016. 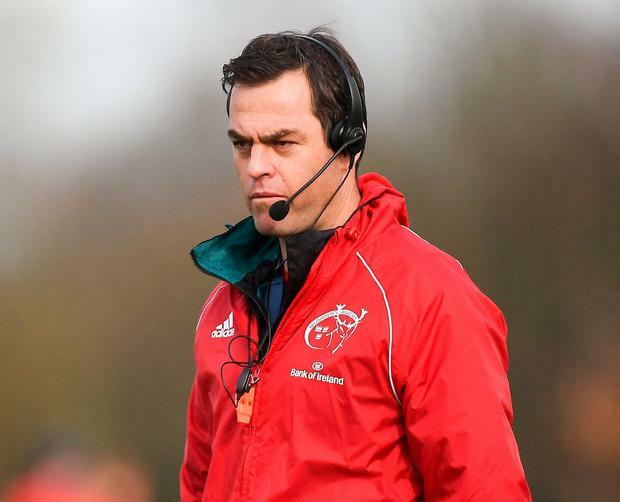 Munster: (15-9) Mike Haley; Ronan O’Mahony, Dan Goggin, Rory Scannell, Darren Sweetnam; Bill Johnston, Alby Mathewson; (1-8) Jeremy Loughman, Rhys Marshall, John Ryan; Jean Kleyn, Billy Holland (C); Fineen Wycherley, Conor Oliver, Arno Botha. Replacements: (16-23) Kevin O’Byrne, Liam O’Connor, Stephen Archer, Darren O’Shea, Jack O’Donoghue, Neil Cronin, Tyler Bleyendaal, Jaco Taute.